“For ten years before the creation of Mickey Mouse, Walt Disney struggled with, failed at, and eventually mastered the art and business of animation. Most biographies of his career begin in 1928, when Steamboat Willie was released. That first Disney Studio cartoon with synchronized sound made its main character—Mickey Mouse—an icon for generations. Many people who know me and know my fiance can see that we have a love of Disney. We go to Disneyland at least once a month, we love watching Disney movies together, we took our engagement photos at Disney California Adventure, and we may incorporate a few Disney elements into our wedding. With that being said, I was excited to read about how Walt Disney started this great empire of his. I wanted to know where the billion dollar company came from and what it took to get there. In the year 1919, when Walt Disney was 18 years old, he began working at Gray Advertising Company as an art apprentice in Kansas City. It was at the Gray Advertising Company that Walt’s animation career began. Then in 1920, he worked for the Kansas City Film Ad Service where he made his first animated cartoons. It was clear that Walt never liked working for other’s, but was grateful for the opportunities to learn more about the industry and hone his skills. Walt would eventually start Kaycee Studios, but would only last from 1921 to 1922. Then in spring 1922, he opened Laugh-O-Gram Films, Inc. Unfortunately, what Walt thought would be his big break turned out to be another failed company. Laugh-O-Gram Films, Inc. wasn’t making any money and Walt eventually had to let it go. This was when he decided to move to California and the rest is history. The story of Walt Disney is quite inspirational for me. Even though at times he had no money, he still believed in what he was doing. He believed that he would be successful even when it seemed like everything was crashing down on him. He is living proof that when you fail at something you love just keep on going because sooner or later your hard work will pay off. When I start submitting my books to get published, I will try to remember Walt’s journey and not let rejection get to me. His story also shows that having people who believe in you makes all the difference. Many people are mentioned in the book who helped Walt during those years before he created Mickey. Whether it was loaning money or letting him use equipment, there was always someone who believed in what Walt was doing. His biggest supporter seemed to be his brother Roy Disney. Personally, having family and friends that support my ambitions makes me work that much more to be successful. The only thing I didn’t like about the book is that it included a lot of addresses and building locations (i.e. this building is located on the corner of..). I don’t think that was necessary, but it could be for other people. If you’re a Disney fan (like me), I would recommend reading this book. I’m not sure if someone who doesn’t enjoy anything related to Disney would want to read about how the company began. 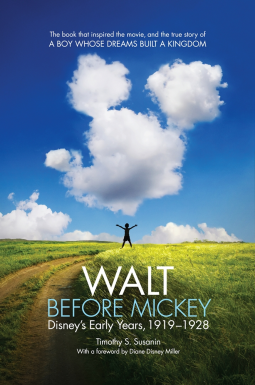 In November 2014, the movie adaptation of Walt Before Mickey will be released. Just watching the trailer gets me excited, especially since I recognize many of the actors and actresses. Thank you to University Press of Mississippi for allowing me to read a copy of this book in exchange for an honest review. I can check this book off my #NetGalleyMonth reading list.